What’s this? 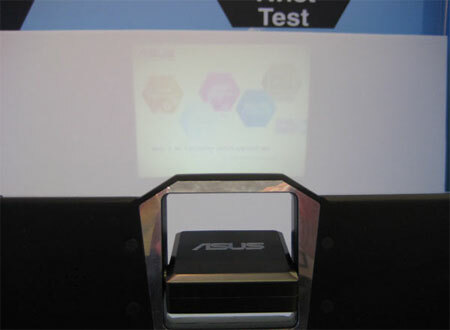 An Asus notebook with built-in projector above the monitor? 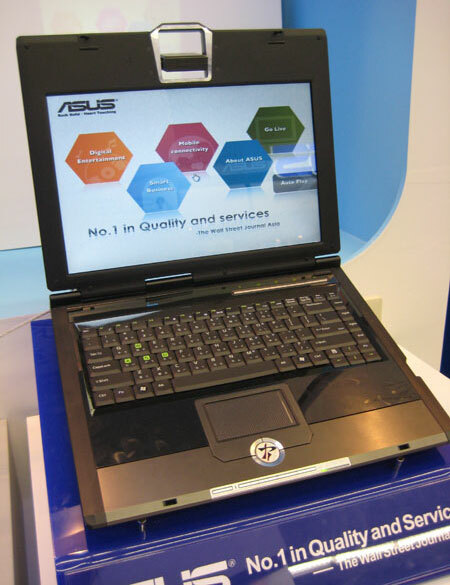 This curious laptop was spotted plopped unceremoniously in a corner at Computex 2008 by PC Perspective. Taking up a large portion of the top of the display was a small “projector” integrated to the chassis. This creates a large portion of what most would called “wasted space” on the bezel above the LCD display but obviously a machine like this would have an incredibly niche audience that would be willing to ignore such facts. The projector itself rotates and swivels in order to tuck in well for closing the notebook lid. I wasn’t able to really see how well the projector worked – the room it was in was pretty bright. We’ll be scoping out some more details on this and the full array of notebooks and mini-notes on display at Computex later today! With all of the hoopla surrounding pico projectors, I’m surprised that more hasn’t been said about integrating them into laptop computers. I need details of this laptop. I am having enquiry for three laptops with LCD projector. I am looking for the details of the laptops having inbuilt projector. i am happy to know Asus notebook is having such laptops. Please provide me the details of the same.